Friends and family of Katrina Dawson gathered yesterday evening in the Common Room to honour the first three recipients of the Bar Association's Katrina Dawson Award: Claire Palmer, Josie Dempster and Ashley Cameron. Present at the gathering were members of the extended Dawson family, including her parents, Jane and Sandy Dawson, her brothers, Sandy and Angus, as well as her sister-in-law, Nikki. Speaking to the gathering, President Arthur Moses SC, noted that the aim of the award is to encourage and assist women to practise as barristers. "Female law students make up over 66 per cent of all law graduates and we need more women to practise at the NSW Bar in order for us to remain a strong and independent bar." Claire Palmer, the inaugural recipient in August 2017 is currently practising from Sixth Floor Selborne/Wentworth Chambers. 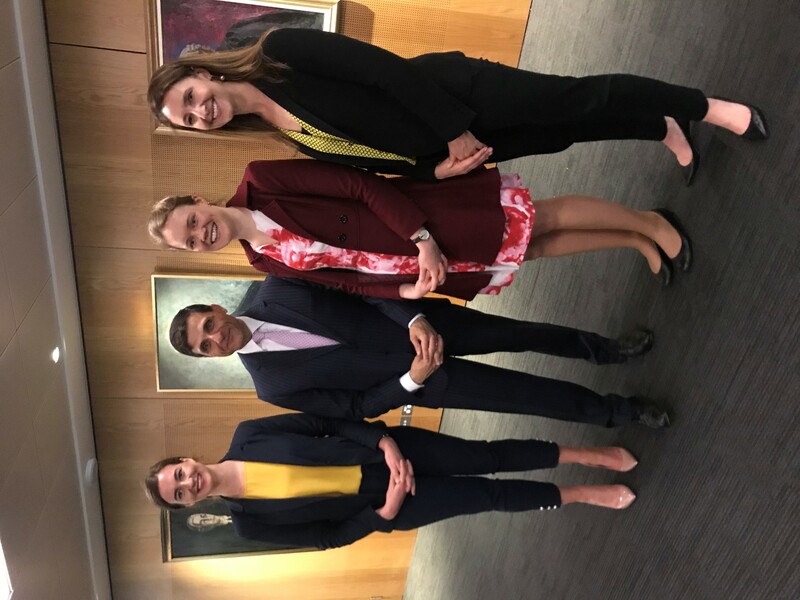 Josie Dempster, who was the recipient of the award in April 2018, is currently practising at the NSW Bar at Key Chambers in Canberra, while Ashley Cameron, who was the recipient of the award in August 2018, starts at the NSW Bar in May 2019. Mr Moses ended with the prospect of a new addition to the Common Room art collection. "This is one of my last addresses in this common room and it is a pleasure to be with you here this evening. I hope under our new president I will be invited back to see the unveiling of Katrina’s portrait, which will be hung in this Common Room. As I have said previously, Katrina will not be forgotten by the NSW Bar." As part of the campaign, the Long Walk to Treatment has involved more than 100 participants walking from Dubbo to Parliament House in Macquarie Street. All members are invited to St Stephens Uniting Church 197 Macquarie St, Sydney (opposite NSW Parliament), this Friday 2 November at 12:30pm to attend this milestone occasion. Members can register their attendance by clicking here. Please join Deputy Presidents of the NSW Civil and Administrative Tribunal and the Commonwealth Administrative Appeals Tribunal as they discuss tips for effective advocacy when appearing before tribunals. The panel includes The Hon. Acting Judge Jennifer Boland AM, Deputy President, NSW Civil and Administrative Tribunal, Ms Jan Redfern PSM, Deputy President, Administrative Appeals Tribunal and Surya Palaniappan, Sixth Floor. Learn more here. The seminar will be held in the Law Society, Level 3, 170 Philip Street commencing at 5.15pm. This is the second CPD in the Women Barristers Forum’s Advocacy Skills Series. In both parenting and financial litigation in courts exercising family law jurisdiction one (or maybe both) of the parties whose relationship has broken down are simultaneously facing criminal charges or the threat of the same. The evidence may be the same but the procedure and consequences may be vastly different. Navigating the pathway requires some cross-jurisdictional gymnastics and cooperation between practitioners in two specialists jurisdictions. Presenters Suzanne Christie SC and April Francis will discuss some of the issues which arise. You are warmly invited to the launch of the book, The Future of Australian Legal Education, by the Hon Justice Margaret Beazley AO, the President of the New South Wales Court of Appeal. The book, published by Thomson Reuters, is a collection of papers that were presented at the Conference held under the same title in August 2017 by the Australian Academy of Law and the Australian Law Journal on the occasion of their 10th and 90th anniversaries (respectively). The launch in the Banco Court will be followed by “Christmas refreshments” in the foyer. The Australian Bar Association (ABA) has published a media release expressing its deep concern regarding recent attacks on Federal Court of Australia judges’ productivity which portrays the process of justice in too simplistic terms. View the media release here. A ceremonial sitting of the Family Court will be held in Courtroom 7C, Level 7, Lionel Bowen Building, 97-99 Goulburn Street, Sydney, at 4:30pm on Thursday, 1 November 2018 to farewell the Honourable Justice Mark Le Poer Trench as a Judge of the Family Court of Australia. Refreshments will be served afterwards. Michael Kearney SC will speak on behalf of the NSW Bar. In order to facilitate final arrangements, please RSVP to Ms Adriana Coutman here by 26 October 2018. ABC TV News featured a story last night on District Court resourcing, featuring comments from President Arthur Moses SC welcoming the appointment of seven additional judges, but also raising the need for a review of the court’s operations. To view the news bulletin, click here. Registrations are essential. For more information and for details on how to register please click here. Malcolm Turnbull to be Guest of Honour - rise2018 Formal Dinner - Register Now! Registrations close 5 November, register here now! The Hon Malcolm Turnbull, former prime minister of Australia, will join guests at the conference’s black tie dinner on Friday, 16 November. An exclusive opportunity to hear from Mr Turnbull. Join guests for an evening of inspiring conversation and gourmet canapes and three-course menu with expertly matched wines. We encourage you to join the conversation, entertain clients and network with members of the Bench, Bar, Government and Media. Single or group tickets (including tables of 10) are available for purchase through the conference website. If you are interested in buying a VIP table at this dinner, please contact conferences@austbar.asn.au. A detailed program, including social events, can be found here. On Monday, 29 October 2018 the attorney general of New South Wales, the Hon Mark Speakman SC MP, will deliver the 2018 Plunkett Lecture at 5.15 pm in the NSW Bar Association Common Room. The attorney general’s topic of address will be “The Royal Prerogative of Mercy”. Senior vice-president of the Bar Association, Tim Game SC will chair the lecture. Learn more here. Everyone is welcome to attend the lecture. The Criminal Procedure Amendment (Pre-Trial) Disclosure Act 2018 commences on Friday, 2 November 2018. The Act gives effect to recommendations of the statutory review of the Criminal Procedure Act 1986 with respect to the mandatory pre-trial disclosure by the prosecutor and the accused person of certain evidence and other matters in proceedings for indictable offences. The Bar Association’s Criminal Law Committee were consulted on the amendments and provided a submission in response to the statutory review. Members may view the Criminal Procedure Amendment (Pre-Trial) Disclosure Act 2018 here. The High Court Amendment (Constitutional Writs and Other Matters) Rules 2018 will commence on 1 November 2018. Following a review of the provisions in the High Court Rules 2004 relating to applications for writs of mandamus, prohibition, certiorari, habeas corpus and quo warranto, the justices of the High Court have agreed a number of amendments to Part 25 of the Rules to provide a more streamlined procedure for the filing and consideration of applications. Learn more here. The Law Council will host two seminars in Sydney on comparative law issues in defamation law reform - on 31 October and 8 November 2018. Speakers include Michael Sexton SC, solicitor-general for NSW, Justice Steven Rares, Federal Court of Australia, Justice Robert Beech-Jones, Supreme Court of NSW. Information about topics, speakers and registrations is available here. President Arthur Moses SC has welcomed today’s announcement by Attorney General Mark Speakman SC of an additional seven permanent judges for the District Court of NSW. "The Bar Association has been very concerned for some time about the lack of resourcing and other support for District Court judges in the face of a crushing workload", Mr Moses said. Read the president's media statement here. Ballot papers for the election of the 2019 Bar Council have been mailed to all those eligible to vote. Ballot papers received after 1.00pm on Thursday, 1 November 2018 will not be counted. Learn more here. Lea Armstrong will be sworn-in as a Supreme Court judge and as president of the NSW Civil and Administrative Tribunal (NCAT) on Wednesday, 31 October 2018 at 9.15am in the Banco Court. Barristers should wear wigs and gowns. Senior counsel should wear full-bottomed wigs. Join us and our Guest Speaker Julia Baird for the Celebrating Women Law Breakfast on the opening morning of the rise2018 National Conference. Host of The Drum on ABCTV, a columnist for the New York Times, the Age and the Sydney Morning Herald, Julia is a critically acclaimed and best-selling author. The President of the New South Wales Bar Association, Arthur Moses SC, has today supported the president of the Law Society of Tasmania, Will Justo, in condemning remarks by a Tasmanian State Government Minister about criminal defence lawyers. As reported in LawyersWeekly, available here, president Justo has sought an apology from the Tasmanian Minister for Police, Fire and Emergency Management, Michael Ferguson MP, for comments made in August which Mr Justo described as "without foundation, dishonourable and disgraceful". Mr Moses said today that “President Justo is right - a skilled, respected and independent legal profession remains as fundamental to the rule of law and the proper administration of justice as ever before”. “I join with President Justo in condemning the Minister’s remarks. Criminal defence lawyers play an important role in putting the prosecution to proof and ensuring that vulnerable, unpopular or offensive people, or persons associated with unpopular causes such as those facing criminal charges, are not left without representation in courts of justice. "Lawyers should never flinch from their duty to help all those who are elected to parliament - ministers above all - understand and accept that the privileges of legal representation should not only be available to the powerful or the popular," Mr Moses said.